Goaltending can make or break a team’s season. Extremely good goaltending can steal wins from the jaws of defeat just like abysmal goaltending can sink the ship of a very good team. There are two perfect examples of this in 2014-15. The Minnesota Wild are a very good team who are getting a league worst .900% save percentage at even strength. The Buffalo Sabres are an extremely bad team who are getting above average goaltending at even strength. The Sabres rank eigth overall at .929%. Currently the Wild are the second best possession team in the NHL with a Score-Adjusted Fenwick of 55.2%. That kind of possession is at an elite level, but it cannot overcome the anchor that is their goaltending issues. The Sabres are the worst possession team in the league. They are currently the owners of an astounding Score-Adjusted Fenwick of 36.0%. In fact they are going to more than likely set the record as the worst possession team since this kind of data has been tracked. The Sabres are 7-3 in their last 10 games and goaltending has been a huge reason for that record. 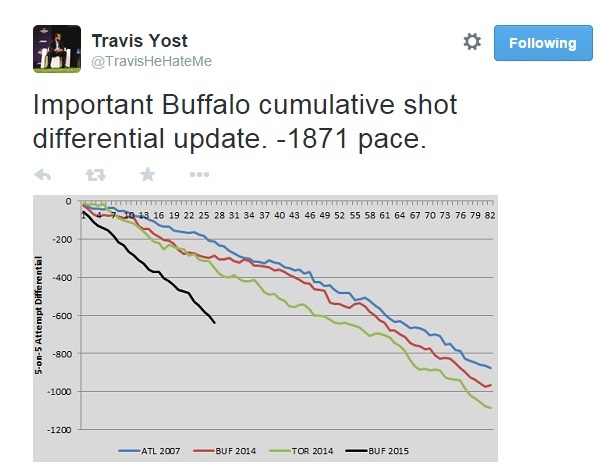 This is a big problem for Buffalo. They are supposed to be losing this year. This is the year that they are supposed to get their franchise center in order to kick start their proper rebuild. Going 7-3 in 10 game stretches is not going to accomplish that goal. Winning is losing in Buffalo right now. The Minnesota Wild are a team that has invested heavily into free agency and veteran players like Ryan Suter, Zach Parise, Thomas Vanek, Jason Pominville, and Mikko Koivu. These players are only going to be in their “prime” for so long. They need to strike while the iron is hot. Missing the playoffs with possession numbers like Minnesota has is almost unheard of. Sitting idle with a great team and league worst goaltending does not seem like an ideal game plan. Given the fact that the Sabres need to start losing and the Wild need to start winning the two teams should come together and attempt to resolve on another’s issues. The Wild need a goaltender and the Sabres need to stop winning because of their quality goaltending. Chuck Fletcher should be inquiring about the availability of a guy like Jhonas Enroth. It’s the holiday season, both teams should look to help each other out.